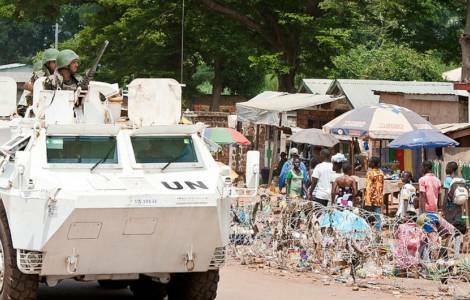 Bangui (Agenzia Fides) - The situation in Bambari is dramatic. The population is at the mercy of the militias. There is no water, food or medicine. Children can not attend schools. This is how the Jesuit Refugee Service (JRS) team depict the situation in the second city of the Central African Republic, north of Bangui, for months a center of clashes. "In Bambari - explains Aurora Mele, a JRS operator - there is a mix of fighters. The Anti Balakas are located on the left bank of the river, the former Seleka on the right. The two groups then generate criminal gangs that exploit the chaos to get rich by looting". When the factions clash, the population is forced to flee and seek refuge, this causes human losses, stress and houses are left empty (which are then looted). For humanitarian operators, it is very complicated to carry out programs that have a certain continuity, also because they themselves and their structures are subject to exactions, looting, threats. At least one third of the NGOs present have left the city. Others have reduced staff to a minimum. Most international NGOs have gathered in one place to better organize their security. "JRS - notes Jean François Alain Ospital, JRS director in the nation - was heavily attacked and looted in the early days of the conflict. Our base has been looted completely and we no longer have the material opportunity to send staff to the site, partly because of the continuous situation of insecurity. We therefore had to reorganize the activities". Even the Catholic Church works among many difficulties. "A good part of the religious have remained there, but continued to receive threats" continues Jean François Alain Ospital. "A community of nuns has remained and continues to run a school. The leaders of the diocese have remained and continue the activities at the Michel Maitre school. The diocesan Caritas continues the humanitarian actions (distribution of food to displaced persons), water services, hygiene and latrines (on sites and schools). Ecac (Enseignement Catholique Associé) continues the educational activities. During moments of crisis, the Bishop remained in Barbari".